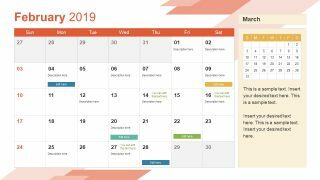 2019 Calendar PowerPoint Template – A calendar PowerPoint for planning events one year ahead. 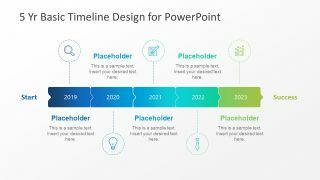 This is a 100% editable PowerPoint template with 12 slides for each month. 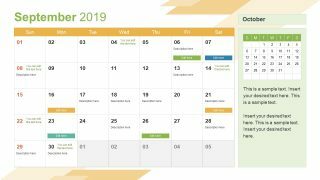 The calendar provides a perfect view of a month along with next month preview on left side. 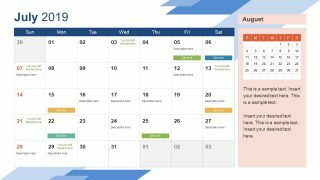 The purpose of the Calendar PowerPoint: assist users to add events and reminders for future. 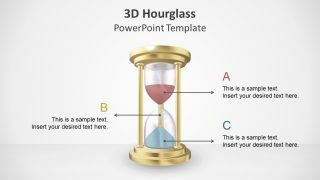 Therefore, this template contains multiple text placeholders and colorful text boxes. 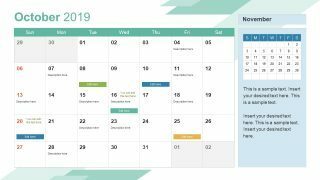 Although users can create their personal calendar since 2019’s month-slides are convenient layouts for prints and digital use. 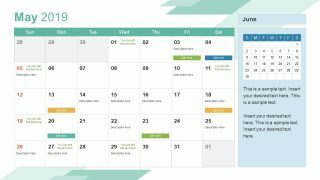 However, the PowerPoint calendar benefits professional to display company or individual’s future goals. 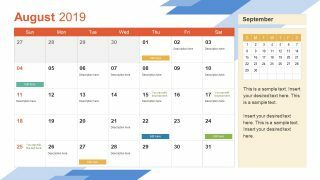 The 2019 Calendar PowerPoint Template is a pre-design slide deck with editable placeholders to insert information. 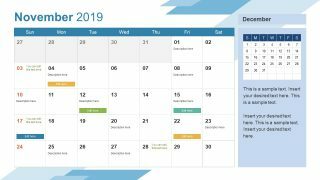 The SlideModel.com offers calendar template for every year in advance. But this time, SlideModel.com is offering two designs of the same calendar, static file and zoom-effect animated PowerPoint The latest 2019 calendar template provides 12 colorful slides and diagonal bars in background. This background design is often used in business presentations like company profile or reports. 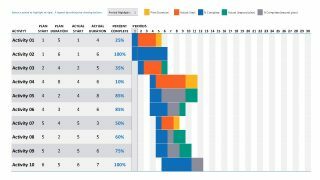 Therefore, users can add these slides to deliver their business-related topics. 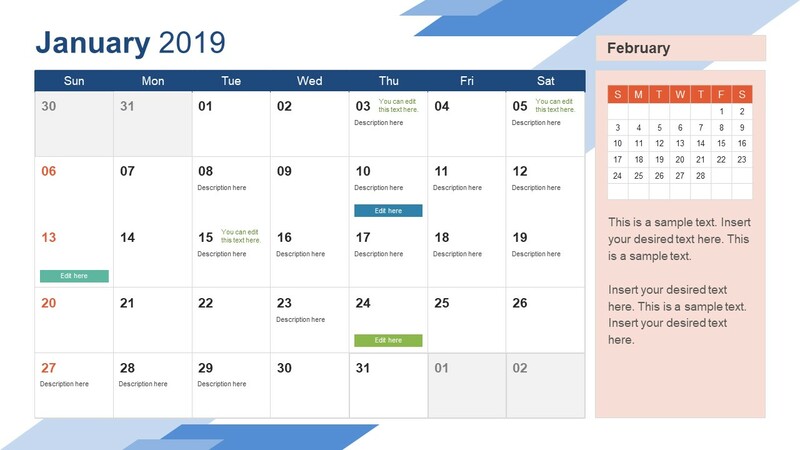 For example, use a monthly calendar in dashboard presentation for monthly sales targets or employee performance reviews. 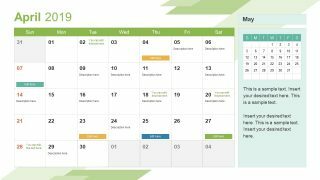 Similarly, demonstrate month’s calendar as a part of timeline details. 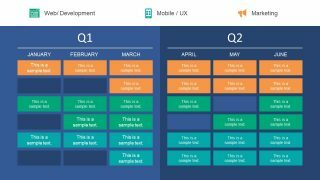 Or, use the preview of month along with Gantt chart to track processes on project timeline. 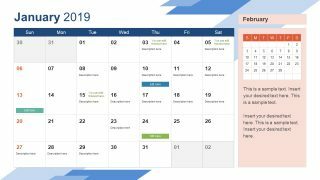 These calendar slides for the year 2019 are easy to change, enabling users to add text and choose colors. 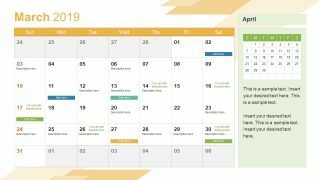 They can insert various text placeholders inside each date section. 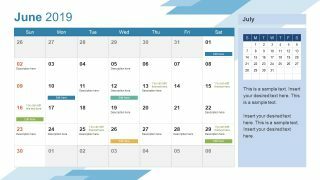 Furthermore, printout pre-designed slides and pin it on board for a visible track of the monthly schedule. These are the simple slides with minimum graphics in the background as outline frame.